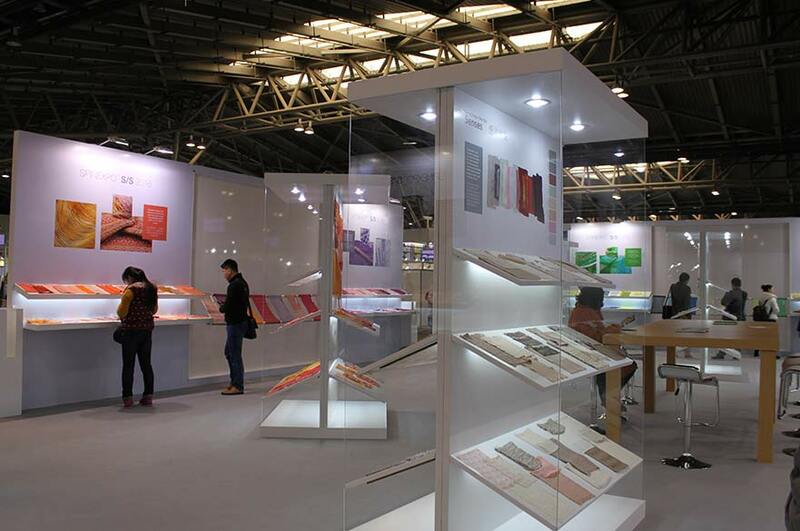 Our Year Two Fashion Knitwear Design and Textile Design students have recently exhibited their work at SPINEXPO in Shanghai, one of the largest international fairs for fibres, yarns and knitwear. NTU's stand at the event showcased samples from selected students from our BA (Hons) Textile Design and BA (Hons) Fashion Knitwear Design and Knitted Textiles courses. All the samples on display were created as the result of a live project with London-based design studio, Sophie Steller. The students were challenged to design a collection of samples using yarn from exhibitors at SPINEXPO, showing off the yarns in the best possible way. Two NTU students were also invited to travel to China, and work with Sophie Steller, the SPINEXPO's trend director. Leanne Mok (Textile Design) and Charlotte Cullen (Fashion Knitwear Design and Knitted Textiles) worked with the yarn marketing team, and were involved in installing the trend and marketing area at the event. Tina Downes, BA (Hons) Textile Design Course Leader, commented: "Being invited to present at the exposition is a wonderful opportunity for us. Our students get the experience of working with current trends and have the chance to work with high quality yarns which is an opportunity they wouldn't have without the sponsorship of high quality manufacturers from SPINEXPO. Over the years, exhibiting at SPINEXPO has led to more live projects with various manufacturers; it enables us to showcase the students' work and form stronger links with industry, helping to set up work placements and internships." Fashion Knitwear Design and Knitted Textiles student, Charlotte Cullens told us: "SPINEXPO has taught me more than I imagined it could! I now have spot on timekeeping! It was especially interesting to work in such multicultural team where you had to learn how to communicate with someone despite having a language barrier. This opportunity has inspired me to carry on with experimenting with knitwear even more. Aside from inspiration, seeing how the knitwear industry works and the excitement that surrounds it has encouraged me to do well in my studies so I can continue being a part of this industry." Textile Design student, Leanne Mok added: "I wanted to attend SPINEXPO so that I could have the opportunity to get involved in the industry professionally and gain experience and insight of the working at an international trade show. During my time at SPINEXPO I developed my presentation skills as the samples for the marketing stands had to be displayed in a particular way. I also feel that I am more professional and have learned that good communication is essential!" Following last year's event, Karine Van Tassel, founder and organiser of SPINEXPO, said: "Our partnership with Nottingham Trent University has increased with mutual respect, as SPINEXPO considers the University to be one of the best, worldwide. At the moment, England is the vanguard in terms of style and technique, so we go for the crème de la crème."